Essential Travel always offers you the best protection for your holiday - whether you are travelling in your own vehicle or a hired car. Now you can purchase a comprehensive vehicle recovery service for any travels within the European Union - including the UK. 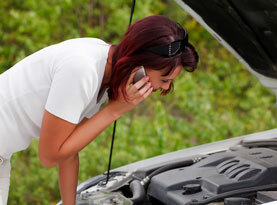 It's always best to travel by car knowing that you are protected in the event of a mechanical breakdown. This is why it makes sense to insure that your trip will continue to run smoothly, even if you experience some car trouble, by purchasing an affordable vehicle recovery plan. Essential Travel has partnered with StartRescue to offer you reliable accident recovery at affordable rates. Recovering and repairing your vehicle overseas can be difficult to arrange and can come with some large unexpected costs. Book your short-term European recovery plan through Essential Travel and travel with peace of mind. StartRescue has an impressive track record when it comes to vehicle recovery. 79% of cars are repaired on-site, ensuring that you get back on the road swiftly and keep your business trip or holiday plans on track. Should your vehicle need further assistance after an accident, we will arrange to transport your car. The European recovery plan also covers overnight accommodation and alternative transport. Now you can book your vehicle recovery without any delay with Essential Travel's easy booking platform. Receive a free and instant quote on a range of vehicle recovery products via our online system. When you're ready to order, rest assured that your booking is secure and that you've saved some pounds too.